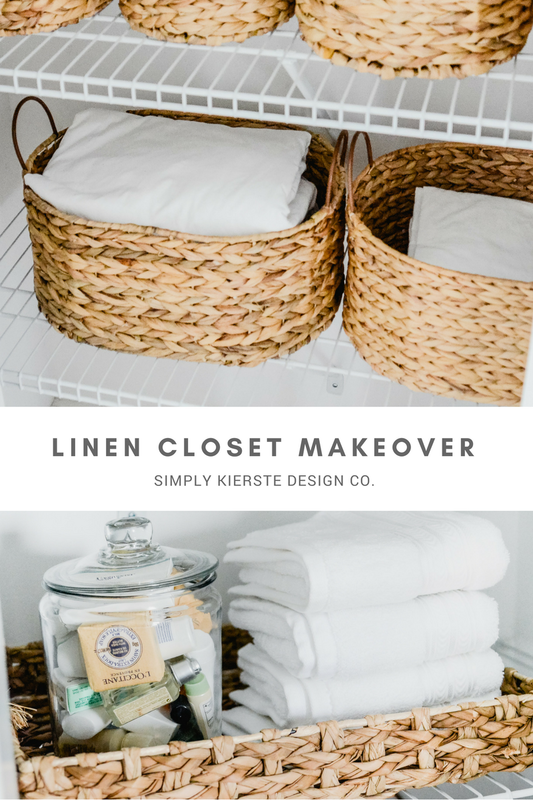 My linen closets were in a major need of reorganization, and last week I got them back into shape! I am SO happy with how they look, and how they function. I recently spent the last 5 or so months in bed, after a bad leg break and then foot surgery a few weeks after that. My husband and kids did an awesome job keeping everything afloat, but some of the details couldn’t help but fall through the cracks. When I went upstairs for the first time in months and opened the linen closet, I knew it was time for a linen closet makeover. I also organized the linen closet in my bathroom, which was already organized, but it just wasn’t very efficient, and it needed a little TLC as well. After a couple of hours and some new baskets, I had two totally reorganized linen closets, and I’m SO happy! I’m not a fancy girl. I live in a real house with six kids, and whatever organization I do, it’s not just for looks. I do like it to be neat, and I love a very organized (and pretty) look, but it has to be functional and practical for everyday use. Part of the problem in this very tiny upstairs linen closet was that it had too much in it—things we didn’t need very often, and they were taking up too much room. Once I cleaned it out and removed those items, it gave me plenty of space for the things we do need and use on a regular basis. This post contains affiliate links. If you make a purchase, I receive a small commission at no extra cost to you. Not terrible, but not great. So many pillows and blankets on the very top and bottom shelves, and at least 10 extra sets of sheets in the bins. To whip it in to shape, I moved the extra pillows and blankets to our guest room closet, and put all the extra sheets in a rubbermaid tote. I always wash sheets and put them right back on the beds, so it’s very rare that I need an extra set. It’s not often enough that I want to take up valuable real estate in this small closet! If you don’t have an extra room or closet, consider putting them in under the bed totes in bedrooms, or even in bedroom closets. I’ve lived in a tiny apartment with 8 people, and I was able to utilize those spaces for all sorts of things. The top shelf has two fabric bins that hold a humidifier, heating pads, and other large items. I put them on top because we do use them on a regular basis, but not often enough to be on a lower shelf. 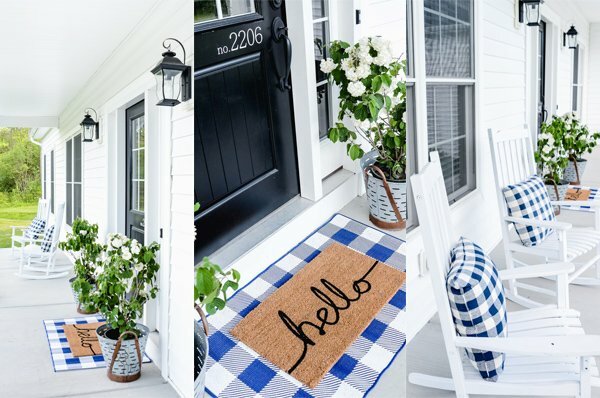 There are a couple of places in our house that I keep first aid supplies–our laundry room (close to the outside action), and the upstairs linen closet, because that’s where the kids’ rooms are. 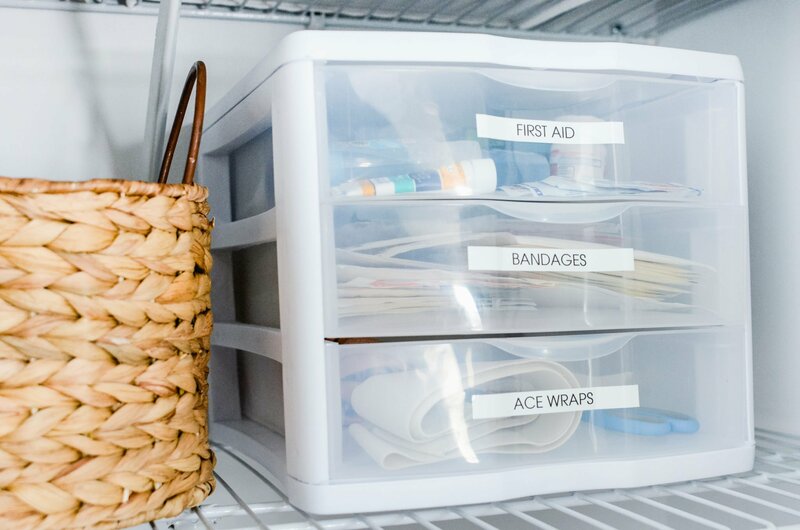 A small, labeled three drawer organizer makes it easy for everyone to find what they’re looking for…and put it back! Next to it is a basket for additional supplies, like hydrogen peroxide, and larger medical items that don’t fit in the drawers. And did I mention I’m in love with my label maker? For reals. The third shelf holds extra washcloths and hand towels, along with a jar of mini soaps and shampoos that we’ve collected from hotels. I keep them on hand for guests, and for when we travel. I keep them on a wicker tray, since we have wire shelving. The lowest shelf has extra towels, plus a large basket with extra toiletries: shampoo, conditioner, toothpaste, and toothbrushes. I don’t keep a lot in there, because we have most of it in our storage room in the basement, and because it’s just for the kids, they don’t need a lot of the toiletries we keep in the master bathroom. On the floor of the closet I have a large basket to keep extra toilet paper. I also tackled the linen closet in our bathroom, which is actually quite a but larger…which is good! We don’t have a lot of cabinetry, so I rely on this closet to keep quite a few bathroom essentials. This linen closet has a different purpose than the one upstairs, so even though I used the same baskets, I organized it differently. The top shelf has fabric bins filled with extra bags for cosmetics and traveling. The second shelf has bins for medicines, and for hair supplies–bows, hair ties, etc. Even though the girls have a bathroom upstairs, they still come down to my bathroom to get their hair done. The baskets on the next shelf hold lotions, perfume, fingernail polish and nail care items, and a sewing kit for small mending jobs. I also keep a broom in the linen closet–I can’t stand hair on the floor, and with four girls doing their hair in here, it adds up in a hurry. It’s so much easier for me to have one in there. I attached it to the door using my favorite command hooks for brooms. I’m really so happy with how it turned out, and I felt the difference immediately on the functional side as well. Everything I really need and use are at my fingertips, and there’s a place for everything. The key is to decide what exactly you need to use your linen closet for, and then go from there. Like it did in my home, they might differ from closet to closet. Is is solely for storage, and you won’t be using it very often? Or will you be using it regularly? What items do you use the most? Answering those questions will help you be able to organize your linen closet the most efficiently for your use.